"Stand back, I'm going in!" Hi folks, as per the 'Subject Line', I have signed-up with AAISP - Hooray!! Theresa D. went through the whole process with me (so patient, and very friendly), and Mike took my DD details from me, so next week, I should get my smashing router through and connected later. 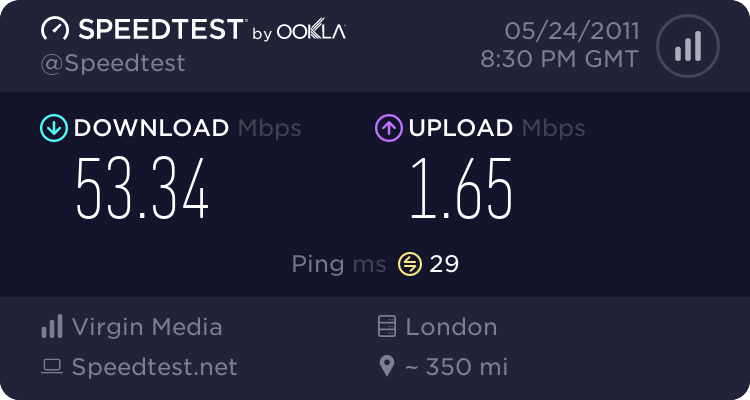 My Be* connection ceases on Monday 10th (tomorrow:s), so, the next we chat, I'll have better ISP. Can't wait! You can see why here. Am synced at 17.5meg down, and 1.1meg up. Here's hoping AAISP can fix what Be* had never attempted to. They will have a loyal customer if/when they do. Re: "Stand back, I'm going in!" To what 'package' are you signing up to with AA? Are you staying on the Be back-haul with AA or moving to 21CN ? I guess this is in relation to the recent blog post I've seen on the Be website regarding upgrading their network? (which is mostly due to capacity problems at the moment). Probably if you waited another year or so, most of that would be sorted out, as they are revamping their core network starting early on next year, with the aim of also supporting IPv6. The drop in usage is disappointing. I've had a chance to think about AA's new offerings, and 100Gb slashed to 50Gb a unit is a real shame. I think they should have left even the weekend off-peak allowance at 100Gb/unit, and made weekday off-peak 50Gb/unit, but decisions are final. Anyway, enjoy your stay, so far, I've had a very pleasant experience! If you are going to AAISP's BE product it will be an interesting experiment to compare the comparative performance of their respective networks. I think this link suggests they haven't dropped a single packet due to congestion on their BE network in the last 28 days !! Yes, this most likely explains why using the Be back-haul with AA is about £20 more expensive per month than 21CN. I'm still connected to Be atm - typiske - It should be off at some point today. Hopefully! Will be on the Be back-haul iirc - glad to get things sorted with AA. Do not have any problems staying with AA if things get fixed [as promised]. I look forward to both that, and to eventually getting IPV6 as and when that happens. 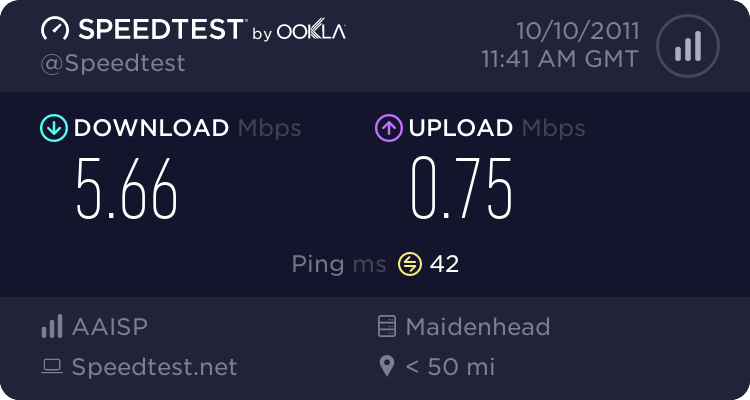 My cables go direct to the exchange just now, which was why my speeds were faster. 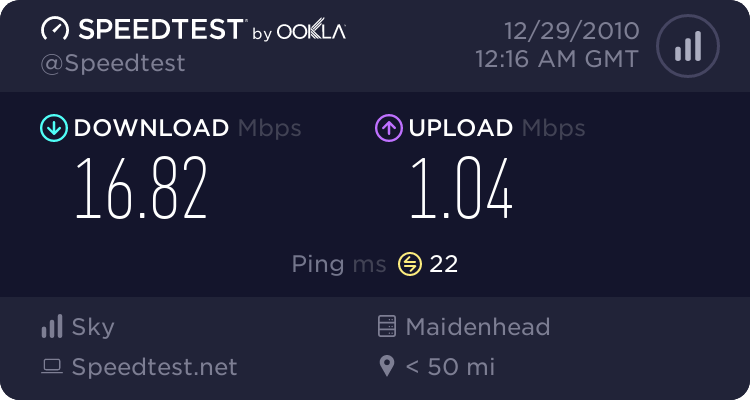 Was great having d/l's at 2.21meg (at the beginning), and 1.4meg up (on the router). Thanks - I look forward to getting hooked up to AA, and have a few tweaks already sorted for my new Billion router when it arrives. So I see. Thank you very much. Just waiting for my Be connection to cease today at some point, and shall await my new router. And, hello to everyone here! *Guesty was born to be mild, (and to TWEAK).